exhaust | I Love Cafe Racers!!! For some reason I seem to be on a Norton kick at this time. I want one. That big long stroke motor, watching the front wheel shake at stop lights…wait a minute, we’re heading into a way different topic of discussion here…uh, back to motorcycles. I think the main reason I’m on this Norton kick is because my friends at ‘Left Coast Racing’ and I are getting ready for another Bonneville LSR run in couple of months with a pair of Norton’s. We currently hold a Land Speed Record with a rather built up 1959 Norton. The very first Norton I ever took for a ride was a ‘rode hard and put away wet’ 750 Commando back in the early 70’s that my step dad rescued from some guys back yard. It was a lot different from the BSA’s and Triumph’s I had been riding, and honestly…at that time, I liked my Lightning 650 a lot better. But, being the good motorcycle souls that we were, we went about resurrecting it…a project that took over a year and a lot more money than my mom knows about. During that same time, we were also upgrading a Triumph Bonneville from a standard 650cc to a Weslake 750 model (again, another story for anther time…and a really good one??). The Commando rebuild was a lot easier thanks to people like Brian Slark, Domiracer and Berliner. At the end of the year both motorcycles were finished, broken in appropriately and then taken out for a proper thrashing…Sunday morning on Angeles Crest Highway. I fell in love with the Norton. Up to that time my motorcycling life had been with high revving two strokes, and somewhat high revving (by then current standards) English and Japanese twins, the Norton was a different feeling altogether. Where my BSA would feel light at the bars, the Norton was dead steady, the BSA needed some revs to get off a corner quickly, the Norton just needed a nudge on the throttle…the BSA needed you to pay attention, the Norton just went along with however you were riding that day (even with a minor (major) hangover). The Norton was sold to a friend of a friend of a friend or their third cousin by marriage twice removed (no Alabama jokes here…) and was never seen again. I had grown to love that motorcycle and was sad to see it leave the garage…the guy didn’t even ride it home, he put it in a pick up truck!??? After all the work we did?… and he didn’t even live 20 miles away!! This was way before the days of ebay and buying a motorcycle on the other side of the world was easy. So today, while working on our other websites, http://www.ilovecaferacers.com and http://www.themotoworld.com and cruising ebay looking for yet another project bike for a friend, I came upon a very nice Norton that is ready to ride and has some very nice bits and pieces. This is a 1974 850 Commando that is a runner but…it has been sitting for years according to the owner so if you buy this bike you really need to go through the carbs, change the fluids, probably the tyres…all the standard stuff but I think this bike will be well worth the effort. The bike has been outfitted with the Dunstall bits that really make it great, starting with the Dunstall 2 into 1 into 2 exhaust system. This exhaust is worth the price of admission alone, it is a work of art in every respect…performance and looks. The beautiful tank and that very slim front fender (I put one of those on the front of my H2, it was pretty worthless as far as fenders go, but I loved how it looked), the 850 also has what looks to me like Lester mag wheels. This Norton only has only 8800 miles on the clock and like I said before, with just some standard service, should be a wonderful ride. Click on the pics below for more pictures and a little more info. This is a great bike for the money. 2004? 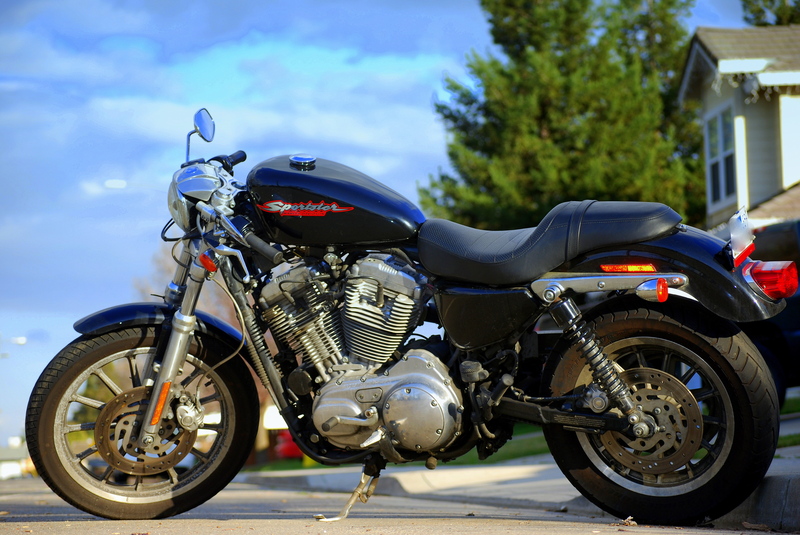 Harley Davidson Sportster – Full Cafe!!! I’m contacting the seller about this bike to try to get more details and more photos. If this is, in fact, a 2004 Sportster, then it is the first full conversion (including tank but minus some cool 18″ wheels) that I’ve seen. A tank like that is exactly what I want to do to my bike. I’ll post updates as I get them. There are three things wrong with this bike. I’ll take the flack if you disagree. First, the seller is unclear on whether or not the bike is a 1978 or a 1979. Maybe that doesn’t matter from a technical standpoint, but it does from a “seller knowing his sh!t” standpoint. Secondly, there is no paperwork to go along with the bike. That can make it difficult to register (especially here on the left coast). Thirdly, the seat. Do I need to spell it out? The TL1000R seat is just wrong. It was iffy on the actual TL1000R, and here it is just not right. The stock seat would be better. A pillow seat would be… well, not better, but not worse. 5 days left in the auction, with 4 bidders, and the price at $510. Good luck if you are interested!! !